Every February, something special happens in Montreal. It's called free cheese. Free, made-in-Quebec coagulated milk protein that makes the masses go yummmm. The kind of fermented food product that compels even the lactose intolerant to reach for another piece. We're talking cheese that is just that good. After all, Quebec is known for its award-winning cheeses. More than 450 different kinds (and more than 32,000 tons) of cheese are produced in the province, including varieties made with raw milk, a completely legal and safe undertaking in the eyes of regional government as long as proper precautions are met. You can taste a few for yourself at the Festival of Our Cheeses, which is part of the Montréal en Lumière Festival. 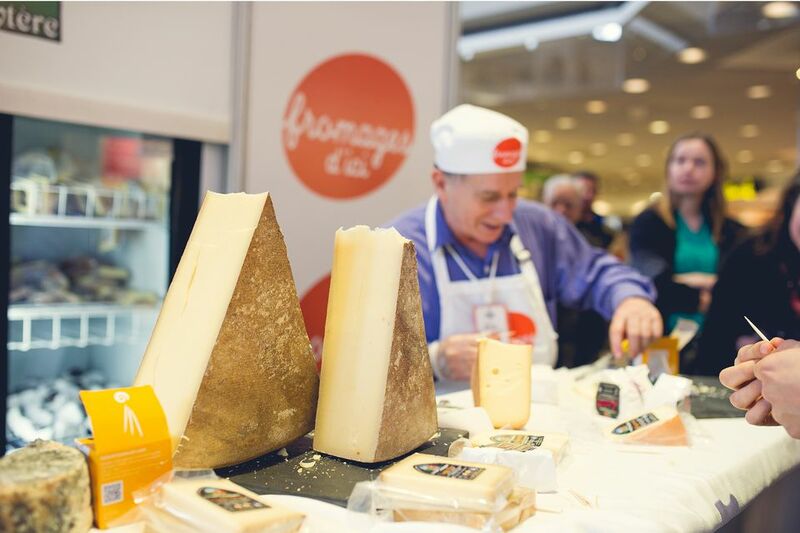 Running over February 21-23, Fête des Fromages offers the public the chance to try roughly 60 different Quebec cheeses made by 20 different producers, free of charge, on site. Cheeses can also be bought on location. Alcohol cheese pairings are an additional possibility, one requiring pre-purchased coupons which are usually $1 each and must be exchanged at participating kiosks in order to sample local wines, beers, and ciders. Coupons are readily available on festival grounds. Note that the number of coupons required per tasting may vary depending on the alcoholic product. The cheese festival is held at Complexe Desjardins Grand-Place at 150 Ste. Catherine St. One of the easiest ways to get there is taking the metro's green line to the Place des Arts stop in the heart of downtown. Festival goers arriving on foot from the East or West should walk Ste. Catherine St. all the way to De Bleury or Jeanne-Mance Streets. Bikes are not permitted on-site. The festival is open from 11:30 a.m. to 7 p.m. on Thursday, February 21 and Friday, February 22, 2019 as well as from 11:30 a.m. to 5 p.m. on Saturday, February 23, 2019. Admission and cheese samples are free. An alcohol tasting coupon costs extra. You will find an information kiosk on the Place des Festivals, at the corner of Jeanne-Mance Street and Ste-Catherine Street. There are also a few items you cannot bring within the festival, including alcoholic beverages, glass and aluminum products, bikes and skateboards, and drones. Now on its 20th anniversary, the Montréal en Lumière festival runs from February 21-24 and February 28 to March 3, 2019. Beyond the cheese festival, you'll want to check out the other fine-dining offerings as well. There is a gourmet program that brings in renowned chefs, wine producers, and speakers for culinary activities. Expect a lineup of cooking workshops, talks, and tastings. For the 20th anniversary, there will be a new event called Nuit Gourmande (February 23, 2019), which features special meals served at the Air France Finest Tables (think: heated outdoor terraces with views) throughout Montreal. You'll also want to see the lazers, light shows, and interactive installations as part of Illuminart. All of these events culminate in Nuit Blanche, an all-night party where around 200 mostly free cultural, musical, culinary, and sports activities are available from 6 p.m. to 6 a.m.